Something about this time of year makes me want to bake bread. Probably because it keeps the kitchen cozy and my mind off the fact that it’s freezing outside and spring is far, far away. Sniff. Anyway, my husband loves English Muffins and he requested that I make the bread version when he saw it on Cook’s Country (Any other fellow PBS fans??). 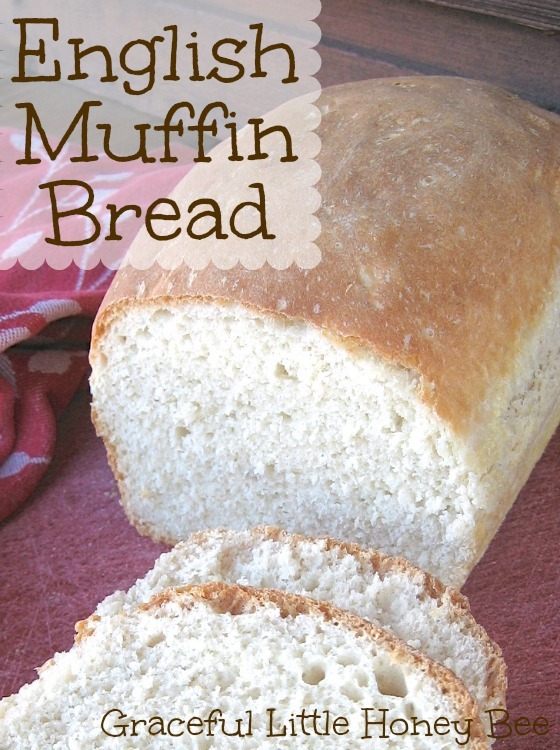 Well I just happened to have a recipe pinned that I was going to try when out of the blue a reader gave me an English Muffin Bread Recipe that she makes and loves. What?!? So I knew I had to give this bread a try and let me tell you I was not disappointed. It was so delicious that I considered eating the whole loaf by myself, but lucky for my husband I practiced self-control and saved some for him. I will definitely be making this recipe again soon and I hope you will try it out and let me know what you think! Step 1: Bring milk and water to around 115-120 degrees (it should be warm to the touch, but not hot) and remove from heat. Step 2: Add yeast and let sit for 5 minutes. It should bubble and start to smell yeasty. Step 3: In a mixing bowl add flour, sugar, salt and baking soda to milk mixture. Step 4: Knead by hand (or with dough mixer) for around 7 minutes. You can grease or flour your hands if it becomes too sticky during kneading. Once finished it should be slightly sticky, but workable. Step 5: Spray loaf pan with cooking spray and sprinkle cornmeal around so that it covers the entire pan. Step 6: Place the dough in the pan and cover with a tea towel. Let rise in a warm place until the dough has doubled in size. This should take around 45 minutes. Step 7: Preheat oven to 400 and bake for 25 minutes or until brown. Let cool, slice, add butter, honey, jam, etc. and enjoy! Bring milk and water to around 115-120 degrees (it should be warm to the touch, but not hot) and remove from heat. Add yeast and let sit for 5 minutes. It should bubble and start to smell yeasty. In a mixing bowl add flour, sugar, salt and baking soda to milk mixture. Knead by hand (or with dough mixer) for around 7 minutes. You can grease or flour your hands if it becomes too sticky during kneading. Once finished it should be slightly sticky, but workable. Spray loaf pan with cooking spray and sprinkle cornmeal around so that it covers the entire pan. Place the dough in the pan and cover with a tea towel. Let rise in a warm place until the dough has doubled in size. This should take around 45 minutes. Preheat oven to 400 and bake for 25 minutes or until brown. YAY! You tried it! :-) I'm glad you love it too. I make a loaf every week now and eat it toasted with a little butter with my dippy eggs in the morning. I am now required to make a loaf or two when visiting my mom as she loves it as well. Could this be made in a bread machine then maybe baked in a conventional oven? I'm not sure that it would turn out the same since you only knead it and let it rise once and I think the bread machine does it twice. You could try it though! English muffin bread is delicious fresh but toasted - YUMMMMM. It also freezes well. If you make two loaves, slice one and freeze the slices on a cookie sheet, then put the slices in a freezer bag so they're easy to separate. Take however many slices you need out of the freezer and let them thaw for a few minutes, then toast them. Spread with jam and butter and . . . ambrosia! I would like to try this with whole wheat flour. Should I increase the amount of yeast? And/Or knead and let rise longer? I would suggest using a half white/half wheat flour combo, then increasing the water amount by a couple of tablespoons. Missy, that's a handsome loaf! I love finding people who enjoy making bread. I find kneading bread dough by hand very enjoyable -- and even therapeutic! Much as I like English muffin bread, I also love to make English muffins. Such fun! Mine didn't really rise or double in size. It came out really small and pretty dense...not fluffy like your picture. I kneaded it by hand and used skim milk. My yeast packet was also something I've had around the house since before the new year. Does yeast expire? I didn't see any best by date or anything on the little yeast packet... Any ideas what I might do differently the next time? I bet your yeast was old. It does have an expiration date. I thought this was going to be stuff grand ma made note what someone made on PBS. Your title is misleading and you need to change it. I am going to check out a few more if they are the same thing I will delete my book mark and not come back. I'm so sorry that you feel mislead, being that everyone's grandma is different I cant see how that might shape your expectations here. The point of my post is to teach people to cook from scratch and do more for themselves, like our grandma's used too. I'm sure you can get behind that idea. I do hope you will stay, but I can understand if you don't agree with me. Have a great day! Tigeroak, what does PBS have to do with this post? The title is very clear," 25 Old Fashioned Recipes Your Grandma Knew By Heart". By heart means from memory, as in you used them so often, you memorized the recipe. It's not Missy Rakes' responsibility if you don't understand what you read. I don't usually comment but your comment is outrageous. Missy Rakes, thank you for the recipes. I love to cook, and especially enjoy back to basics recipes like these. Is it possible that your yeast is old? I would try it with a fresh batch of yeast and see. Also, sometimes my yeast bubbles more than other times. I do not know as I am not familiar with gluten free flour. I made this today after jotting down the recipe last night. It was delicious and easy, very easy! The crumb was perfect and the taste beyond perfect. Made some grilled cheese sandwiches using this bread and oh my word..the best. Had a little crunch from the cornmeal that I loved. Definitely will be making it again!